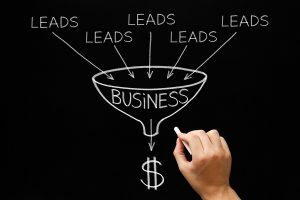 Do you have a real estate lead funnel in place? Prospecting is a numbers game. Buying and selling real estate requires significant sums of money and lots of time to complete the transaction. It’s inevitable that the vast majority of leads you come into contact with will never pan out: they’ll put off buying a home, decide not to sell after all, work with a different agent, have their financing fall through… any number of different reasons that mean you won’t get any result for the effort you put in. So if you want to hit your income targets for the year, you need to get your information in front of as many prospects as possible, without doing more work than you need to for sales that aren’t likely to close. Successful real estate agents know that a lead funnel is key – and ideally, multiple funnels for different types of leads. Let’s say you’re targeting first-time home buyers. You come up with two different offers, a free report or a free seminar, and put together a real estate postcard campaign promoting your offers. Obviously, you need to follow up on any responses you get, but you’ll have the most success if you create two different funnels for the different groups. For people who requested the free report, you can add them to your list for postcard campaigns for first-time home buyers. But people who make the effort to actually attend a seminar, that’s a much more highly-qualified lead. In that case, you want to move them into a more aggressive lead funnel: send reminders before the seminar, call them afterward to ask about their experience and see if they have more questions, sign them up for your email newsletter, and generally contact them more frequently than your “standard” list, as they’re likely ready to buy a house very soon. It’s also a good idea to have a separate funnel for referrals. A solid referral is one of the easiest paths there is to a completed transaction: the prospect already has a measure of trust in you, so all you have to do is follow through. Treat a referral well, and you’re both gaining a new client and strengthening your relationship with the referrer. But if you drop the ball with a referral, not only do you lose out on that sale, you’ll also nix any future referrals or repeat business with the person who referred them. This is especially true for referrals from networking partnerships. Every time you hand out your real estate business card, you’re starting a relationship that could eventually net you hundreds of thousands in additional business. Having a lead funnel specifically for your referrals ensures that you’ll treat them like gold, and not run the risk of letting any of them drop through the cracks.